Ever have any leftover mashed potatoes? I know that seems like quite the rare possibility, but… maybe if you do? Toss ’em in your waffle maker. 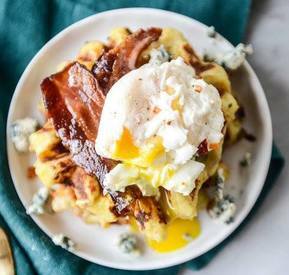 Add some Bacon, some blue cheese, fry up an egg (because, um, of course), brush that dang waffle maker with Bacon grease (yep I said it) and go to town.